This exercise focuses on the lower lats, rhomboids, biceps brachii. This variation activates the biceps more than any other pull-up because it uses a supinated (underhand) grip, and your elbows are kept closer to your body. This allows a considerably longer range of motion. Due to its nature of movement the chin-up is a fantastic exercise for activating the full length of your lats. 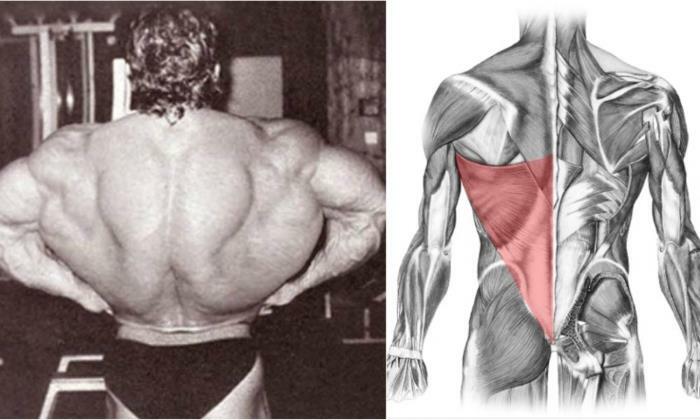 Namely, the pull is initiated with the upper part of lats. As you climb up, the focus shifts downward, hitting the lower lats as they take you to the top position. Additionally, considering that it also activates the rhomboids, traps and mid-back, this movement might be the best total-back exercise. And with the involvement of so many muscles, this variation is one of the easiest pull-ups. You can’t have a complete back routine without including overhand and underhand pull-ups. To avoid dividing the focus between your biceps and your lats, try not to wrap your thumbs around the bar. 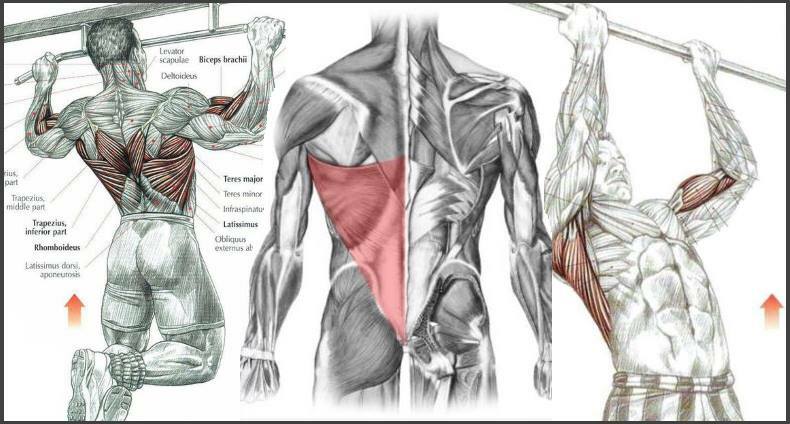 This will force a greater involvement from your lats. If you want to pay greater attention to your lower lats, then you should think about including this exercise in your routine. In order to rip the full benefits of the exercise you should keep your body vertical throughout the move. Once you’ve reached the top position, squeeze together your shoulder blades. You can spice up this exercise and slightly shift the focus hitting your muscle from a different angle by using wider underhand grip. This exercise focuses on the lower lats, rhomboids, traps, brachialis. Similarly to the underhand grip, the range of motion in this variation is longer allowing you a full focus on the whole length of your lats, with the involvement of the traps and rhomboids. It also strongly activates your biceps. Yet, with the contribution of so many muscles this variation is fairly easy to execute. However, you can spice it up and add difficulty if you use a wide-grip. This will reduce the range of motion, and take out the biceps from the equation, putting a greater focus on your rear deltoids. We recommend alternating between narrow and wide grip when doing this exercise. This exercise focuses on the rhomboids, traps, lower lats, wrist flexors, brachialis and brachioradialis. By performing the pull-ups with towel attachments you get to work on your forearm strength, as you rely on your grip for executing the pull. You can execute this move both with wide, and narrow grip. Use multiple towels arranged along the bar for the former, and a single towel for the latter. You can adjust the grip difficulty with the towel thickness. The thicker – the harder. However, this might result in serious fatigue of your forearms, and will weaken your grip strength reducing your ability to lift hard. Consequently, you should consider doing them at the end of your back-day routine. The primary focus of the towel pull-up is on your forearms. As a result, if your grip is not strong enough, your lats won’t be capable to complete the pull. Because of that, this move is mainly reserved for more experienced gym goers. On the other hand, the towel pull up can improve your grip strength, improving your efficiency of the other pull-ups, so you might consider performing it even if you are a beginner. Introduce it at the end of your back day routine, doing 2-3 sets till failure. Try increasing the number of reps with every next training. The answer to this age old question is very simple, and it depends on your objectives and constitution. Namely, if you want to work on your forearm strength, avoid using straps. However, if your forearms are not strong enough and hinder your back development, using them is not only prudent but wise as well. According to the studies, the straps can help you execute a couple of additional reps. On the other hand, by using the straps you are not solving but only bypassing the problem. That’s why you might consider reaching for the straps after you’ve performed as many sets as you can without their help.